I had two intriguing posts I could’ve filled this spot with today. One riffs on the Kirk Cameron exhortation to SBC pastors, while the other deals with the balance of Word and Image in Christian faith and practice. But I won’t be writing on either one today. Being a blogger means coming up with penetrating commentary day in and day out. Some people can blog every day, but I simply could not produce quality posts if I did so. I need to ruminate on topics for Cerulean Sanctum. Most of the posts you read have stewed in my mind, heart, and spirit for days. Readers get genuine fermented thoughts, in other words. When the Pacific tsunami hit just after Christmas a few years ago, stories came out of folks seeing the wave swell coming, then running and running, but succumbing in the end because they could not escape the inevitability of that punishing wall of water. Try as I might over the years, I’ve thought and thought about a theology of the tsunami, but I can’t seem to come up with any spiritual advice, any wisdom at all, to shed on the subject. I guess I’ve never quite understood what good it is to see the tsunami coming but have no ability to avoid it. That captures the idea, in part, but the evil net that rises up to ensnare comes unseen. The comparison doesn’t work. Agabus’s prophecy only clouds my understanding of this issue. He saw the wave about to hit Paul. What I find odd about this prophecy is that it is one of an unchangeable inevitability. It told of a tsunami that could not be outrun. Yet if it had not been told, the outcome would have been the same: Paul would have gone about his business, wound up imprisoned, and ultimately executed all the same, prophecy or not. 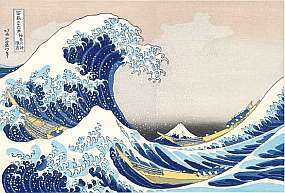 Why let everyone see the inevitable tsunami? All it seemed to do is distress the rest of the believers. I’ve experienced seeing the tsunami coming before it hits, yet at no point have I been able to outrun it or witness others outrun theirs. Why then? The knowing only creates distress long before the wave crashes onto land. Cerulean Sanctum gets some of the best readers of any blog out there. I was talking with a reader today and noted how blessed I’ve been to have such astute people join in the conversation here. Have you experienced the “inevitable tsunami” in your life or the life of someone else you know? Why do you think God allows us to see the tsunami from afar if there’s nothing that can be done to escape it? The part that seems most disconcerting to me is that the tsunami seems inevitable whether the victims are good or evil, akin to Siloam’s Tower. Situations where the evil are clearly punished yet the good suffer collateral damage also puzzles me. It puzzles me even more when the damage the good sustains cripples them long term while the evil seem to bounce back quickly. The corollary is when the punishment intended for the evil bounces off them and wipes out the good. I cannot understand what God is doing in those situations, yet I see them happening all the time. I’d like to know the answer to this question too. Last night I couldn’t sleep for the sorrow I carry for several of my family members. One is serving the last few months of a jail sentence, 21-years-old and already facing a grim future–who will hire him now? ; another is 24, seriously mentally ill, and dreading his release date in five years. I want to scream, “I told you years ago this would happen if we didn’t get professional help!” but what good would that do now? All I can do is offer support and guidance to the youngest one coming up. But isn’t that what I tried to offer the others too? After my Dad was forcibly retired mere months before he was to receive his full pension, he descended into an abyss that defied all our ability to help. If he had put a gun to his head, we could’ve gotten all sorts of help. But his method of escape took a decade to reach its end. And no one would help us. We all saw where it was going, but our hands were tied. Our last gasp came when we contacted the Veterans Administration, but they refused to help unless we could prove that he had never in the past received any help from the VA. Despite my research and hundreds of hours on the phone with VA officials, we were unable to prove that negative and my Dad died soon afterward. So I know your pain. I prayed for you just now. To me the issue appears to be one of submission to God. Paul willfully decided to face the oncoming “Tsunami”. How would his life have been different if he had chosen to run away? How would our lives be different if Paul decided to run away? The Bible is full of examples where we can’t escape an oncoming event – but we always have a choice in how we respond. Do we fully embrace God, and trust in him? Or do we try to escape our fate and do things on our own? In my life I believe God often lets me see the tsunami in order to remind me that I need to (daily) place him at the pinnacle of my life. Sadly, I am not very good at this. So I often need to see a Tsunami coming to be reminded that I need to rely on God’s strength and not my own. The problem with the Paul/Agabus prophecy, though, is that Paul had always been “resigned” to his fate. Prophecy or not, he would have gone to the executioners. Why know? Should any of us fall into the hands of some villainous fiend, what does it prophet us that he taunt us for days about the myriad ways he would torture us to death before he actually tortures us to death? That may be the extreme example here, but why the knowing? Doesn’t that only inspire more fear and trepidation? I never questioned the usefulness of foreseeing- I guess it is my combination of neediness to “be ready” and my Prophets sort of personality. I think it battens down the hatches inside us, it readies our hearts and minds for the test. When it concerns others… it helps to give me the needed patience for dealing with their confusion and problems. So I always welcome whatever forewarning God wishes to give me, even though I have ignored some of it to my own detriment and chagrin. I’m not sure I share your desire to know. It’s a little like one of those thrillers where the bad guys have hidden a bomb somewhere in a building you can’t escape and you’ve only got three hours to find and defuse it. Problem is, you can’t defuse it. It’s going to destroy the building no matter what you do. Would you rather know or go out blissfully unaware? I vote for the latter. Have you noticed that when angels show up in the bible the first things they say is “Don’t be afraid.” That’s logical, if I saw an angel I’d be frightened. Then they speak, question, fulfil what their responsibility to that person or people is. It’s also very respectful. When Jesus talks to people in the bible, He listens. He asks questions. Conversation happens. “… And since he would not be persuaded, we ceased and said, “Let the will of the Lord be done. Paul was part of the community, they needed to talk this out and find their own peace. They listened, they pondered, they discerned, which is part of what the church does. We. Seems to me that God, in sending a prophet, was being profoundly respectful and loving of all involved. And the concern, and talking through probably did wonders for Paul. If he is told his outcome, has support, he can get on about kingdom business in peace until that time comes. I have been warned, a couple of times very specifically. At least once for a group and at least once personally. It amazes me God loves me that much. I have no doubt was done to prepare (us) me, to give me an opportunity to work it out, settle myself, to give me Himself – peace that passes understanding, make preparations so I could get on being His child and honouring Him and those involved. It isn’t about your ability to give theology or advice. If you are privileged to be one of the ‘we’ then talk it out, listen, go to prayer, stand along side and don’t stop until all have peace. God isn’t being cruel, He is being loving and present. I guess I’m nowhere near Paul. I’d rather not know long in advance. I’ll speak to you as a writer. What voice is that passage written in? If witnesses had not been present to tell, what would be lost? I’ve been thinking about this and have not come up with a decent answer. Perhaps this is a major blind spot for me. Ultimately, all foreseeing – all prophecy – that exists is for the glory of God. Yes, there may be hope (or warning) for the present in the words of the future. The real issue, though, is that God may be glorified — that man will look back and say, “God said it would be this way. He is sovereign in this, as He is in all things.” Like the disciples said, “Let the will of the Lord be done.” Paradoxically, the circumstances of the future may not bring us comfort, but knowing it is from the hand of God may. Will think more about what you wrote. Ah, your response to Bob, clarifies a bit. I’m not going to make things worse for you by being a Job’s comforter. And when I am troubled sermons are the last thing I need. I am profoundly grateful to God for warnings in my life, He has not left me comfortless, I have not been condemned. I agree with what Bob said – I have been pointed to the Maker of the waves. I realize I ‘m coming in a bit late here…and I do not have the gift of foreseeing tsunamis. But as I read your initial question, I couldn’t help but remember how some of the old testament prophets (Jonah being the most well-known) were shown an impending tsunami. And as they revealed to others what they saw, the tsunami struck or didn’t strike in response to corporate repentance. My son died from ALL last year at the age of 20. After a year of treatment and remission, relapse came. In my heart I felt the Lord telling me that he would not survive. So what was important was MY RESPONSE, my faith, my trusting. Afflictions are for but a moment but the weight of glory is eternal. Ignorance maybe bliss, but the truth sets us free. My son came to a saving knowledge of Christ but his siblings are so very hurt, angry and lost. Where is the good in that? I do not know yet hast thou brought up my life from corruption. There is a man named Bryan P Carraway he is on staff at Regent University and has a interest in helping people interpret dreams and visions. Hope that helps a little. Am praying. When I see suffering I can do little to mitigate, these verses from Lamentations give me comfort. We suffer because of the world being fallen and not only us, but the whole of our world. Sin has reduced everything to a pale shadow of what God created and no living creature escapes it. If God grants us visions and dreams of things (spiritual tsumanis) to come, it is to give us time to pray and prepare and seek Him while He can be found. 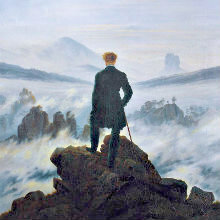 As someone who occasionally has prophetic dreams, I too have experienced being unable to change what I know is to come. Old Testament prophets wept even as they prophesied to those who would carry out terrible deeds, unable to prevent what was to come. I once dreamt of the church where I gave my heart to Christ falling under the shadow of darkness, becoming a shell that held no light and it has come to pass. I told the pastor of the dream and he did apparently take it seriously, but it did not prevent the dream from becoming true years after he and the pastor who followed him left for other opportunities. I was not taken unawares, but it still hurts. May the crucible prove you as gold, Dan.